When are you favorite artists going to release new music? MusicHarbor knows. With MusicHarbor you can follow artists closely and be the first to know about new albums, singles, EP's, concerts and news. Keeping up with the latest releases from your favorite artists has never been so easy. "It does what you need it to do extremely well"
You can import artists from your Apple Music library, or add them manually. Additionally, you may explore upcoming releases by other artists in your favorite genres and discover new music that is similar to your preferred taste. You can use MusicHarbor to keep track of concerts from artists you follow and/or concerts scheduled for a specific city. You can see the latest news about artists you follow right on the app! Choose between a specific artist or the top headlines about the music industry. 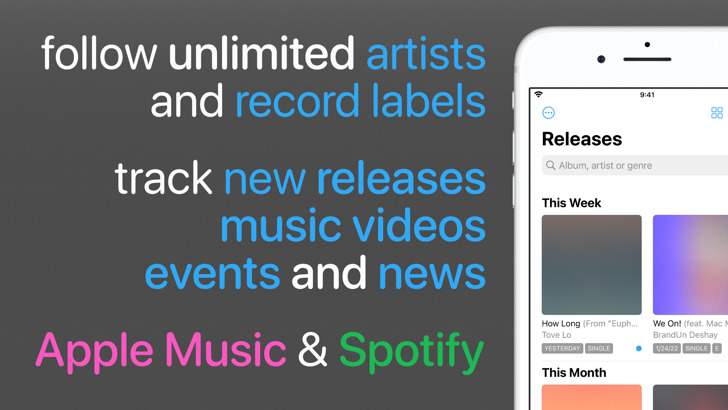 MusicHarbor brings the feed concept to music releases. See all albums from artists you follow on a single centralized timeline, chronologically ordered. Also, you can filter by types like the album, EP, single or remix. Managing albums has just become more enjoyable and neat. Neat and intuitive, MusicHarbor is amazing for finding new music recommendations and discovery of albums, new songs, and artists. Discover the freshest and hottest tracks and albums, so you can indulge yourself with amazing new music. Any album or song release is easily viewable with a direct link on Apple Music. Receive a notification when a new album is available and be the first to know! No more missing the freshest releases from your favorite artists that usually get hidden in your Apple Music feed. The best thing is that you can manage the notifications and select to receive notifications for everything or select between Album, Single, EP and/or Remix. Follow your favorite artists & get their latest music releases with instant notifications and updates. This version includes translation to German thanks to a contribution from Sebastian Kern!